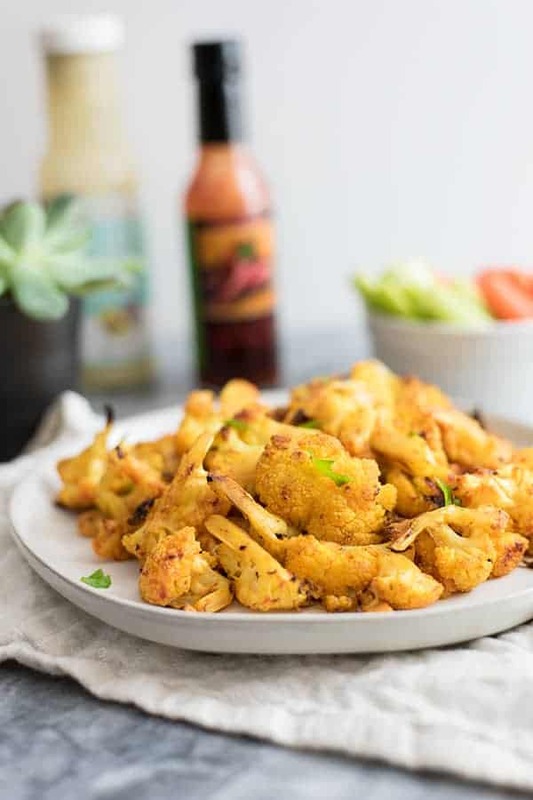 These vegan cauliflower buffalo wings are simple enough for dinner but could also be perfect for your next get-together! 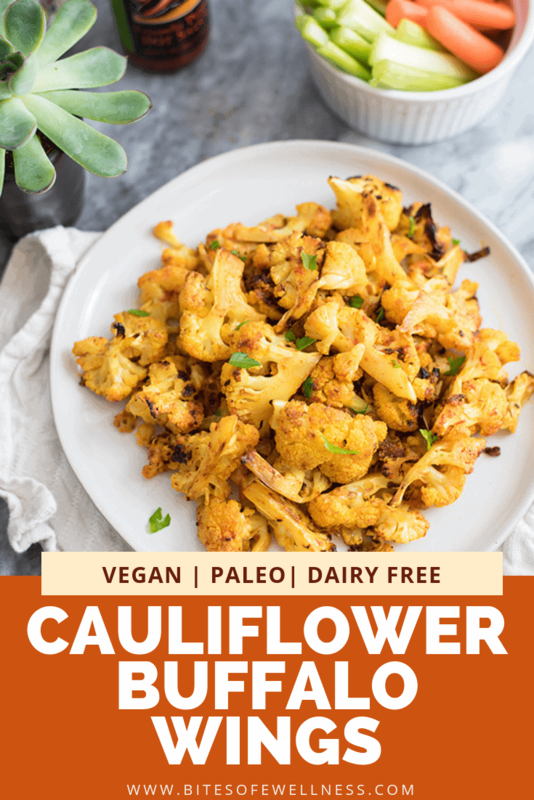 Ready in 30 minutes, these vegan cauliflower buffalo wings are paleo, whole30 friendly and require just a few simple ingredients! I’m sure you already know the flavors I’m going for in these vegan cauliflower buffalo wings! Spicy, a little buttery and I just can’t stop eating these, they are so good. Yeah that flavor! Well these deliver! And unlike the other recipes out there, I’m didn’t bother breading these or making them overly complicated. Roasted cauliflower, butter flavored coconut oil (or ghee), hot sauce, garlic powder and a little turmeric! These wings smell just like the wings they used to serve at the first job I ever had! I worked for a pizza shop and they were famous for their thin crust pizza and buffalo wings! I always used to ask him what the secret was – he said butter and hot sauce. That’s all he added and people went crazy! I learned that sometimes simple is better. But sometimes you can make simple just a little bit better! Take these cauliflower buffalo wings, I added turmeric to the sauce. 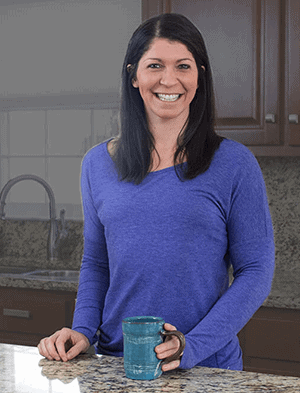 It intensifies the color and adds some anti-inflammatory benefits you wouldn’t normally get! 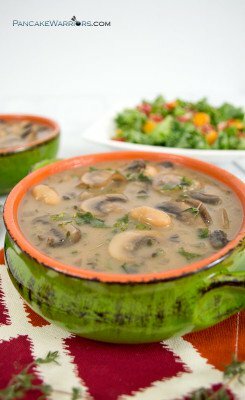 This recipe uses butter flavored coconut oil, but you could easily use ghee if you aren’t vegan. I actually made this with the spiced buffalo ghee from Trader Joe’s which is where I got the idea to add a little turmeric to the mix! If you love buffalo flavored everything, you have to check out these buffalo salmon cakes with chipotle ranch dipping sauce. 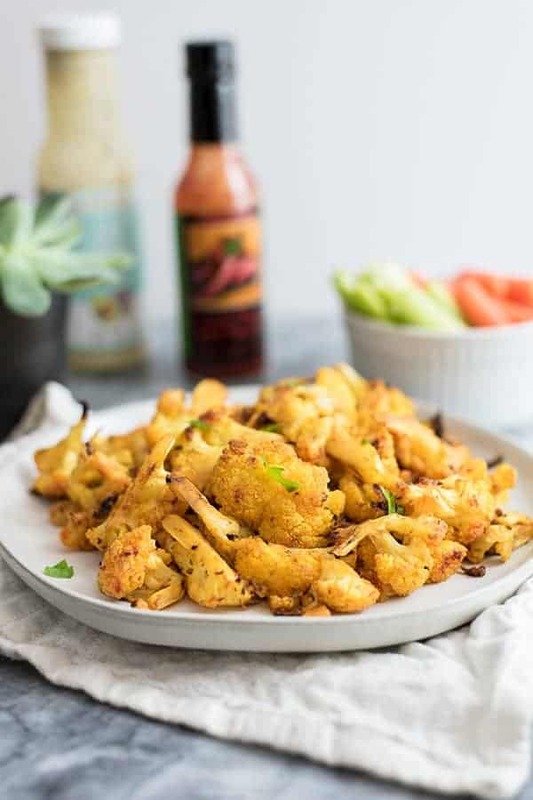 The chipotle ranch dipping sauce would be perfect with these cauliflower buffalo bites as well! These would also be great with homemade hummus! I highly recommend this zucchini avocado hummus recipe if you are throwing a party and want something simple but delicious! To be honest with you, my spice tolerance isn’t very high. Sometimes sriracha makes my eyes water. But I can easily polish off these vegan cauliflower buffalo wings without any problem! So if you don’t like spice, you should still try these! 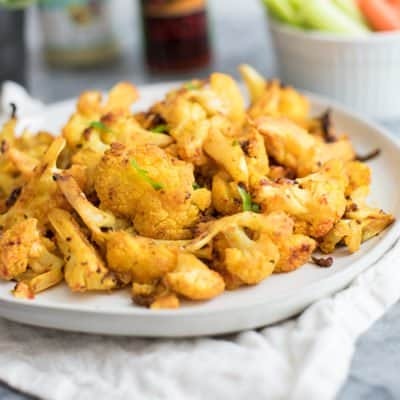 While the cauliflower is baking, combine the butter flavored coconut oil (or ghee), 2 tbs. of hot sauce, garlic powder, salt, turmeric and pinch of black pepper. Stir well. 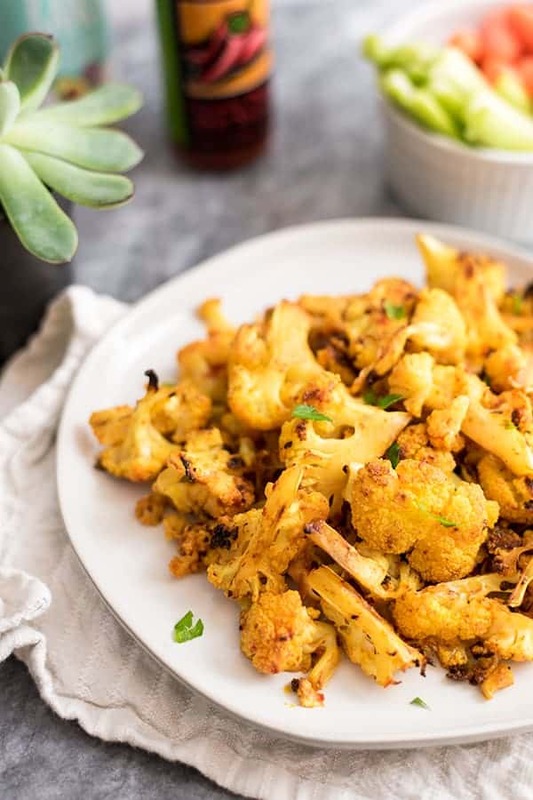 Put the cauliflower back in the oven and cook for 10 minutes. 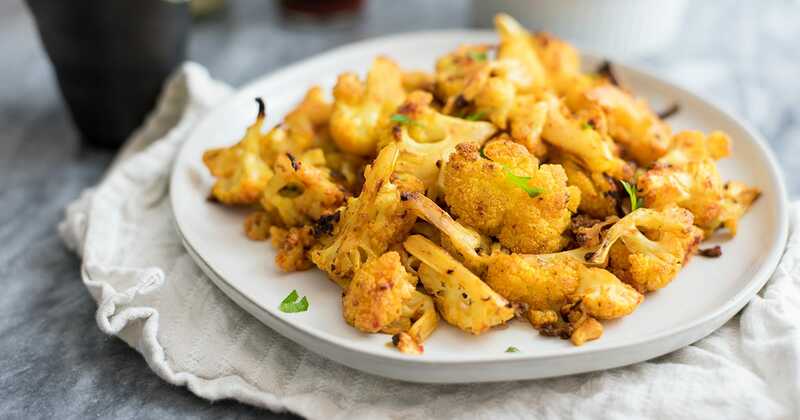 Take the cauliflower out of the oven and add the last 1 tbs. of hot sauce. Stir and serve hot or room temperature. I can’t wait to try this awesome recipe! Happy to see you here at Full Plate Thursday and thanks so much for sharing with us. 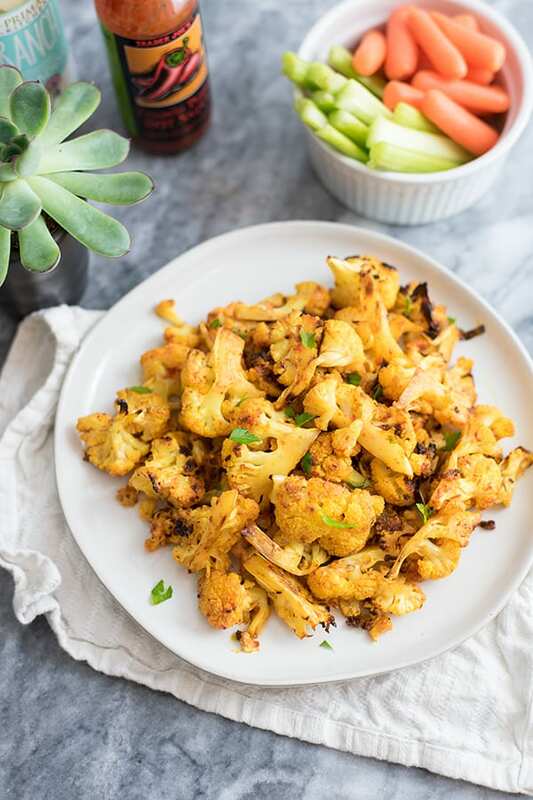 What a terrific, flavorful cauliflower recipe!! YUM! 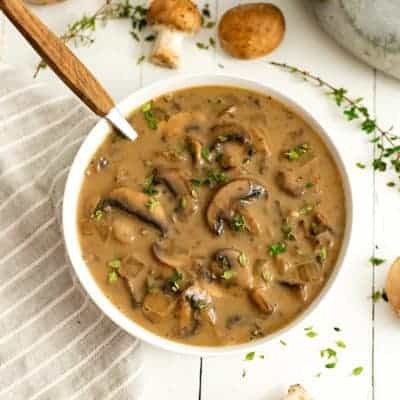 Great vegan option! I love adding a veggie dish to the party!